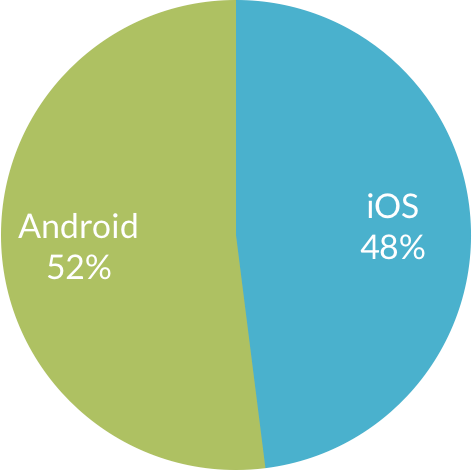 We all know the mobile OS market share is led by Android, especially world wide. Android devices have flooded the market with many carriers offering 2:1 deals. In addition, while Apple is one of the largest device manufacturers in the world, there are more companies making devices that run Android. This article showcases some of the biggest trends that we've identified between iPhone and Android devices bidding on the Handbid App. Keep reading to see which device type generates the most bids on silent auctions. 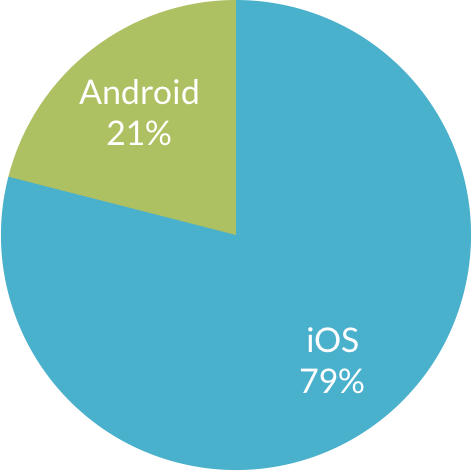 As a result, one would expect that the majority of devices used at charity auctions with mobile bidding would be Android phones. Or, at least the mix of iPhone and Android devices would be rather event to reflect the roughly 50:50 split in North America. But that is NOT the case. In fact,our data (and experience) shows that the overwhelming majority of bidders at charity fundraisers own an iPhone. To analyze, this, we took the last 2,000 auctions run on Handbid and looked at bidding data. It paints a very different picture. Out of the 55,537 bidders who downloaded our app in our last 2,000 auctions, we noticed a few intriguing stats. An overwhelming majority of bidding devices come from iPhones, or Apple devices. When we look at bids that each bidder placed, we see a similar difference. Again, a majority of bids were placed on a iOS device, but Android devices placed more bids per bidder. If Android has any claim on iPhone it is that the Handbid Android bidders tend to bid more! 1) Those who own an iPhone tend to be of a high economic status. We can’t prove this (perhaps someone else can) but we believe it to be true. Are iPhone users richer than Android users? Not necessarily but iPhone users are more likely to be “wealthy.” We believe this to be true because, well… iPhones are more expensive. While most don’t realize that when they pay $30/mo in their cell phone contract for a phone, buying an iPhone X outright is going to cost you anywhere from $1,000 to $1,150, whereas Samsung’s Galaxy S9 will run anywhere from $600 - $700. And, to continue on the point made before, people with higher household incomes are more likely to own iPhones. So we think this is not front page news, but we do find it to be interesting (and fun to analyze). 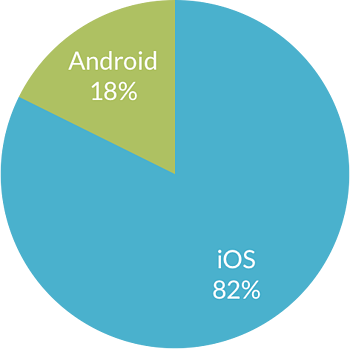 This statistic, among many, are another reason why mobile bidding solutions are so valuable. Outside of increased revenue and reduced headaches, the data collected can provide some really valuable insights to charities into the behaviors and nature of their bidders. We look forward to digging into other data topics similar to this one in future blog posts. Like this post? Subscribe using the form below & never miss one of our articles!